Wanting to give his blue cheeses a more complex, nuanced flavor than most other blue cheeses, the owner of Oregon’s Rogue Creamery turned to a nearby vineyard, Carpenter Hill Winery, and asked for leaves from the Syrah vines to wrap around wheels of his blue cheese. As soon as the cheese was aged and ready, it began to show up at competitions, winning prizes and awards of all types, thanks to its depth of flavor. So far, no creamery in the Midwest is wrapping grape leaves around cheese — blue or otherwise. At least not yet. But in Orwell, Ohio — in the northeast corner of the state — Susan Morris of Mayfield Road Creamery is making use of another resource that wine makers may overlook — pomace, that vegetative mix of pulp, seeds, skins, stems and some juice, leftover after grapes have been pressed. ‘We had talked about doing something with the wineries in the area,” says Morris. But initially her thought was to brush Gouda with an apple wine. The more she thought about it, however, the more she wanted to experiment with pomace, so two years ago Morris called Arnie Esterer, owner and winemaker of Markko Vineyards, and asked if he’d be willing to give her some of the pomace from his Pinot Noir pressing. ‘I’d usually just throw it back in the field,” Esterer says. ‘So I said, yes.” He was not unfamiliar with the practice. ‘I had heard some creameries were doing this to lend a local flavor to their cheeses,” he says. Since he’s always enjoyed Mayfield Road cheeses (he serves it at wine tastings in his tasting room), he was happy to help. ‘Arnie is always up for anything,” says Morris with a laugh. The day after Esterer pressed his 2010 vintage, Morris was there with about 30 large, five-gallon cans into which she scooped the pomace. 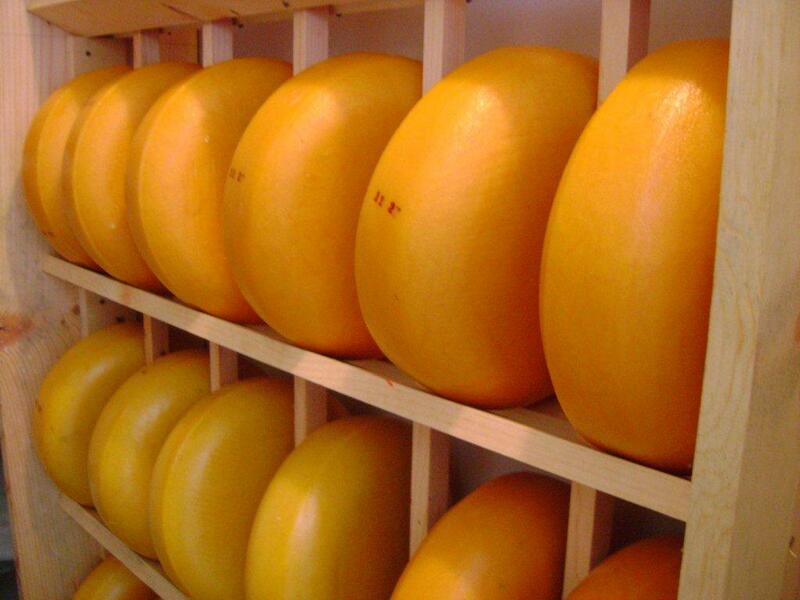 Back at the creamery, she assembled her cheese wheels — all Gouda — and began to layer them into the cans, three to a container, all buried deep in the pomace. ‘I check them after four months,” she says. But she doesn’t remove them from their rich burials until five to eight months have passed. Because she’s working with a natural product — both in the case of the wine as well as the cheese – she has found mold on some batches. When Morris does, the whole can is pitched, but more often than not, when the Markko Gouda wheel emerges, it is fragrant with the scent of wine and tinged a soft raspberry color. In addition to the color and the distinct wine flavor, the Markko Gouda also picks up texture from the pomace — its surface made bumpy with skin, seeds, and other edible grape parts. ‘People really like it or they don’t,” says Morris. Most of the cheese is sold at specialty shops in the area, the occasional farmer’s market, at her creamery, and in Markko’s tasting room. Esterer is positive about the cheese that’s embellished with his waste products. ‘People like it,” he says. ‘The wine flavor, the texture…” And Esterer, himself, has always been a fan of his namesake cheese. ‘The Pinot Noir worked well,” he says. But because his vineyard doesn’t produce much Pinot, Morris collected pomace from Cabernet Sauvignon pressings last year. “It may have produced an even more flavorful cheese. Of course, when you’re dealing with milk from grass-fed cows, you’re talking about a healthier cheese and a better flavor overall,” says Esterer. 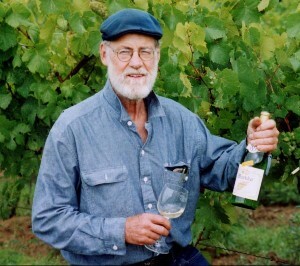 Esterer doesn’t put much in the way of additives in his wines — which is another reason Morris went to his vineyard first. ‘He makes an old-fashioned, natural product that fits in with ours,” she says. But you’re not going to keep a good product as an exclusive for long. Last year, Morris says she was approached by another winery in the area and asked to create a cheese for them. ‘People want local. They want something that comes from the area and tastes of the area,” says Esterer. Whether or not ‘terroir” can be tasted in cheese is up to the person doing the tasting, but locavores swear there is a difference. The ability to recycle pomace is not to be discounted either. Esterer says it’s an age-old tradition. ‘In France, all the winemakers pile their pomace in the middle of the village each year and people come and scoop it up to make brandy.” Using pomace to make cheese may not be something that has occurred to the French yet, but Ohioans are lucky that Morris thought of it.